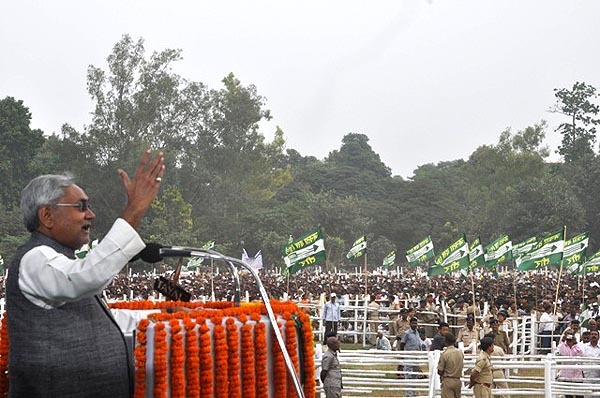 Patna,(BiharTimes): The Adhikar Rally organized by Janata Dal (U) on Nov 4 in Patna was not only a simple political rally to invoke the sentiments of Bihari sub-nationalism but a well crafted political tool of Nitish to carry forward his own political agenda in a given space. The rally was organized for demanding special category status to Bihar. “Bihar is a backward state and development made so far is inadequate. The state is lagging far behind to national average on per capita income, investment, electricity consumption, health and other human development,” said Nitish. Elaborating further he said “it would take at least 25 years for the state to catch up national average at the given rate of growth,” which according to the Bihar government claim, is one of the fastest in the country. Earlier this year on the demand of Nitish, Prime Minister appointed a high-level inter-ministerial group to look into the issue. It, later, rejected the demand as the state failed to meet some of the criteria needed for this category? But through this rally Nitish tried to hit many birds with one stone. The rally was targeted against the discriminatory attitude of Centre towards Bihar. But his arch political rival Lalu consider it a political drama and recalled. “In 2002, when NDA was in power and Nitish Kumar was railway minister, he forced the then Prime Minister Atal Bihari Vajpayee, during his visit to Patna, to announce that the central government will not accord special category status to Bihar but would rather consider special economic package.” “At that time he should have exerted some pressure as he was a very powerful cabinet minister in Vajpayee government. As National Development Council takes decision on this matter he should have mobilized NDA chief ministers as they are the members of the NDA,” he added. Nitish knows it very well that hardly any other chief minister would push his case as several of them are themselves in the queue and seeking the same demand. Now the chief ministers of Goa, Odisha, Rajasthan and Jharkhand have publically demanded special status considering their backwardness. Granting special status to Bihar may open a Pandora’s box for the centre. But the demand would definitely brighten the pro development regional satrap politician looking beyond identity politics of Hindi heartland. No political party in the state can afford to ignore this demand at any forum. “Nitish has virtually hijacked this whole issue and made it his own party agenda. He even sidelined the alliance partner BJP in this campaign,” said, Abdul Bari Siddiqui, the leader of opposition in the state. Political observers feel that this whole move is not to create pressure on government at the Centre but to show strength and dictate their terms to senior ally BJP. Even in the rally he openly announced that his party would support only that government at the Centre, which would promise special category status to the state. This clearly gives a signal that JD(U) can not be trusted as committed ally any more. The party’s role in the selection of prime ministerial candidate can’t be taken very lightly. To create pressure on the Centre, Nitish announced a similar rally at Ramlila Maidan in March next. This could be his major exercise to project himself as prime ministerial candidate before parliamentary election 2014. He would try to encash his political persona at the best created in last couple of years. It is clearly evident that in the game of numbers he would stand nowhere as his party has major presence in only one state. Conceiving his larger role and giving his political demand some credential, he extended the demand to some more backward states. He even suggested, if possible government should consider changing the critera to accommodate some more backward states under this fold for inclusive growth. But only time would tell how other regional satraps would take his words. It is a fact that two major political parties, Congress and BJP would keep aloof as this demand will boomerang on them. Nitish may be eyeing to grab the leadership of third front. But the larger question is: how other regional parties would take him. Certainly he is preparing for a bigger battle in 2014 election.